Western nations have lamented China and Russia's vetoes of a UN Security Council resolution condemning Syria's crackdown on anti-government protests. France said it was a "sad day" for Syria, while the US ambassador to the UN expressed "outrage". The resolution had been watered down to try to avoid the vetoes, dropping a direct reference to sanctions. Meanwhile, Syrian TV has broadcast images of a woman it said Amnesty International had declared dead. The proposed resolution, drafted by European states, was the latest effort to pressure Syria over a crackdown in which the UN estimates more than 2,700 people have been killed. The text had been changed three times by the European allies, who had tried to accommodate Russia's and China's objections. It referred to "targeted measures", rather than sanctions, if the crackdown continued. The US and the EU have imposed several rounds of sanctions on Syria. The UN Security Council has issued a statement, but no legally binding resolution. French Foreign Minister Alain Juppe said the veto marked a "sad day for the Syrian people", and for the Security Council. The Council "should raise its voice against a dictator who is massacring his people and seeking to stifle the Syrians' legitimate hope for democracy", he said. "The UN Security Council has not lived up to its responsibility for peace and security in the world," he said. "Germany will continue to push, both internationally and especially within the European Union, for a clear position and pressure on the Syrian regime." The EU, Britain and Denmark also denounced the veto. "The decision of Russia and China to veto this resolution and to side with a brutal regime rather than the people of Syria is deeply mistaken," said British Foreign Secretary William Hague. Earlier, the US envoy to the UN, Susan Rice, said Washington was "outraged" by the vote. She said opposition to the resolution was a "cheap ruse by those who would rather sell arms to the Syrian regime than stand with the Syrian people". Ms Rice walked out in protest when Syria's envoy to the UN, Bashar Jaafari, said the US was using its veto power to protect Israel, which could be seen as "partaking in a genocide". In explaining Russia's veto, UN Ambassador Vitaly Churkin said that draft was based on "the philosophy of confrontation", repeating Moscow's concerns that a resolution could lead to a Libyan-style foreign military intervention. China's UN ambassador Li Baodong said Beijing opposed the idea of "interference in [Syria's] internal affairs" and that sanctions or threats of sanctions "may further complicate the situation". Turkey, once an ally of Syrian President Bashar al-Assad, said it would press ahead with plans for sanctions against Syria despite the UN vetoes. Ankara has already introduced an arms embargo, and is expected to conduct military exercises near the border with Syria this week. The government of Syrian President Bashar al-Assad says it is in the process of introducing reforms and is speaking to members of the opposition. It blames the unrest on armed gangs. Meanwhile, Syrian TV ran an interview with a woman it said was Zainab al-Hosni, an 18-year-old whom Amnesty International reported last month was believed to have been beheaded and mutilated. 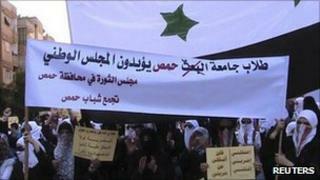 Amnesty said she had been seized in Homs in an effort to intimidate her activist brother. On social networking sites, activists suggested that the woman shown on Syrian TV could be a lookalike.